MESH invites selected authors to offer original first-person statements on their new books—why and how they wrote them, and what impact they hope and expect to achieve. David Makovsky is Ziegler Distinguished Fellow and director of the Project on the Middle East Peace Process at The Washington Institute for Near East Policy. 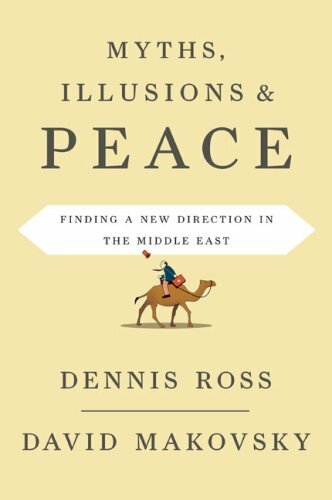 His new book, with co-author Dennis Ross, is Myths, Illusions, and Peace: Finding a New Direction in the Middle East. Dennis Ross and I wrote our book because we thought there is a need to base policy toward the Middle East on the complex realities that America confronts there. For too long, ideological blinders or theoretical views of the region have guided those who shaped and made U.S. policy. It is time that changed. And that is why we decided to write a book that explores the myths and the illusions that too often have driven American approaches to the region. We are not content only with exposing why certain key assumptions have been wrong and have produced mistaken policies. We want to outline and explain the key assumptions that ought to be driving what America does and how it does it in the region. If the Middle East did not matter, we could be more cavalier in looking at wrongheaded assumptions about it. But with American interests and well-being increasingly riveted on what happens in the Middle East, we no longer have that luxury. With 9/11, we learned the hard way that the Las Vegas rule doesn’t apply to the Middle East: what happens there does not stay there. Pathologies in the Middle East will not remain isolated. They can and will affect us and our security. Whether we are dealing with an ascendant Iran determined to pursue nuclear weapons, or Islamists who seek greater leverage in the region and beyond, or trying to see whether peace between Arabs and Israelis remains in the cards, we had better understand what is possible and which choices and options provide us the best possible leverage to change the behaviors of those whose behaviors must be changed. And that, ultimately, is what we set out to do in this book. We are not just seeking to debunk mythologies. We are trying to explain the path we ought to be taking in the Middle East, while also illuminating the core set of principles and assumptions that should underpin that path. Dennis is a renowned practitioner of diplomacy and is now the head of the Obama administration’s National Security Council’s “Center Region” that includes the Middle East and Iran. I served as a journalist for American and Israeli publications. As a journalist, I tried not just to cover stories in the region, and not just interview leaders and those in and outside political circles. My goal was to observe the Middle East from the ground up and see the interplay of the different forces—social, economic, and political—that shape the dynamics of the region. While Dennis and I may both look for larger trends, we understand that U.S. policy toward the Middle East cannot be shaped by abstractions such as neoconservatism or realism. Those who seek to impose grand theories on this part of the world—whether of the right or the left—miss the context from which policy must emerge. We offer what amounts to a centrist view of what to do in the Middle East. Unlike the Bush administration, we favor active diplomatic engagement. We understand the importance of power in an area characterized by conflict and coercion. But just as the military option should never be taken off the table, neither should diplomacy ever be dismissed. Nevertheless, unlike many of the Bush administration’s critics—those who portray themselves as realists but who seem to reflect little understanding of Middle East reality—we don’t favor indiscriminate engagement with any and all actors, including nonstate actors such as Hamas and Hezbollah. Is it “realistic” to engage diplomatically with groups like Hamas if it means we undercut Palestinians who believe in coexistence and a secular future for their people? Our mantra is engagement without illusion. We must pursue peace without illusion while understanding the difficulty of achieving it, but recognizing the consequences of not making the effort. We must compete with the radical Islamists by using force where necessary, while realizing that only other Muslims will discredit the radicals and that any strategy for competition must rely on social, economic, political, and diplomatic tools. Engagement cannot be a panacea for peace or for preventing Iran from going nuclear, but it creates possibilities for success and produces a context for tougher policies should it fail. Developments in Iran are fluid. Yet, they point to a theme that we try to hammer in the book. Create a context whereby it is the regime in Iran and not the United States that is the issue. If international sanctions against the regime are required, it is because the world understands that it is Tehran’s behavior that is problematic. Whether engagement is a successful American strategy or a failed tactic will depend upon Iran’s response. In the end, we offer a guide for a new realism—one shaped by understanding the factors that actually govern behavior in the region; one guided by always understanding the context in which our policy must proceed; and one inspired by the need to preserve hope and possibility in a region too often characterized by neither.